Thread lifts are a treatment used to lift sagging, aged skin in your face or body and their use has been perfected by award winning Doctors at The Treatment Rooms London. The treatment uses small absorbable threads carefully placed under the skin using a small needle sized entry point. These can then be tightened to pull up sagging skin and create a natural looking lift. There is an immediate effect resulting in a more youthful appearance. However, as the threads dissolve, this process stimulates collagen production which maintains and improves the lift even more! How much can we lift? This really depends on the extent of your sagging skin and fat. This can only truly be assessed in person- so we encourage you to contact us and book your free consultation. 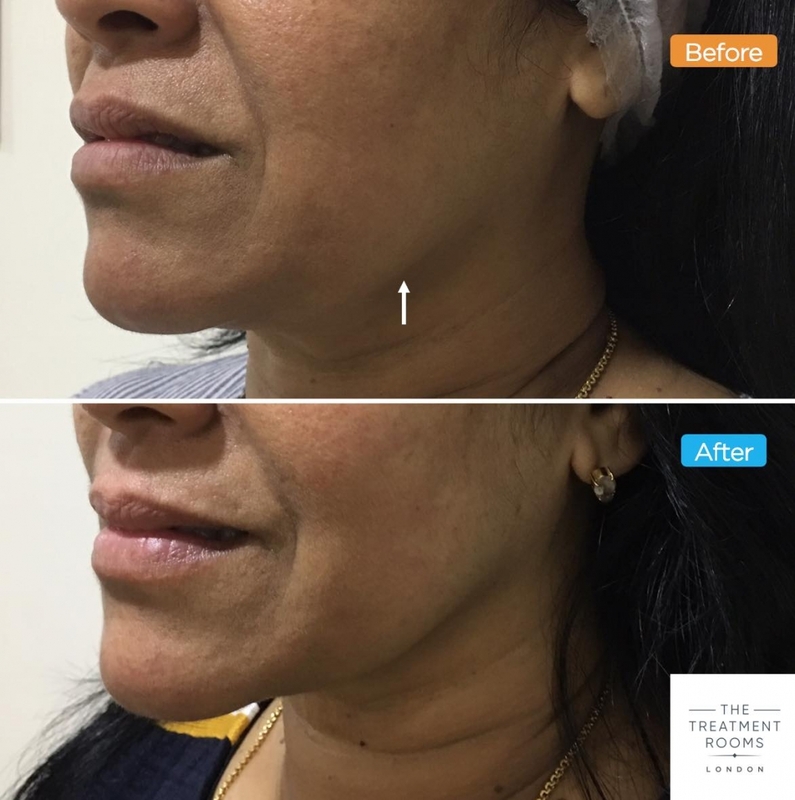 Jowl lift using PDO threads can achieve natural contouring of the jawline. More before and after pictures- Face Thread Lift or Body Thread Lift. Who would benefit most from Thread Lifts? Thread Lifts have been around for over 25 years over which time the technique and type of threads used has been refined and perfected. The procedure when performed with experienced hands is safe and well tolerated. At The Treatment Rooms, we like to inform our patients of the main risks, side effects and rare complications so they are as prepared as we are to tackle them. Prior to the thread lift procedure our doctors will apply local anaesthetic to numb the treatment area. During the procedure you may feel a tugging sensation as the thread is passed under the skin. After treatment, you may feel some pain or tightness in the area treated which will settle with time. This is usually well managed with simple pain relief. What aftercare is there after treatment? Following a thread lift procedure, our patients are given personalised post-treatment instructions to ensure they have a comfortable recovery and achieve full, long lasting results. Our aftercare instructions are specific to the procedure a patient has had and they are also given on the day of treatment. How much do thread lifts cost? Thread lift pricing varies on a case by case basis depending on the number of threads used. An area includes both sides of the face or body.